Crafted of glass and glitter. 4.13"W x 1.38"D x 2.17"T.
For more than 60 years, the artisans of Christborn have produced exquisite Christmas ornaments in the quaint Bavarian city of Doerfles-Esbach. 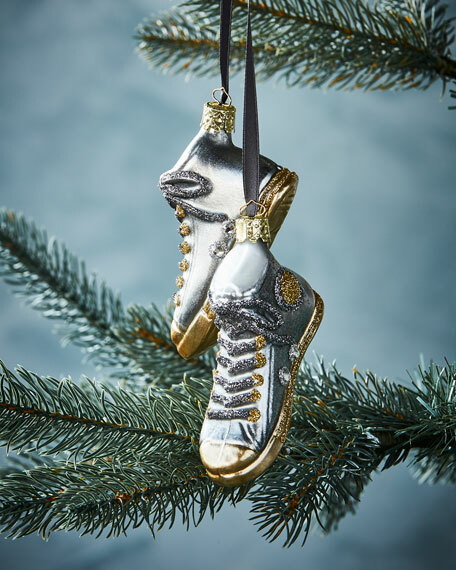 Now under the direction of the third generation of the Wegner family, Christborn ornaments are each made of mouth blown glass, delicately silvered and dipped in various lacquers, and finally hand painted in an array of traditional and innovative designs.